Lately I've felt overwhelmed by everything going on in my world(s), particularly in the areas this blog focuses on: Sports (the baseball playoffs have begun and they've been awesome), Music (the skies have been pouring out new music, good stuff that I want to listen to and write about), and Literature (still reading plenty of Joyce material and have lots to say about it). I have a whole bunch of ideas for posts, even a couple unfinished posts, and an outline for an essay that I will not only submit to the James Joyce Quarterly but also will send in for possible presentation at the North American James Joyce Conference next year. It's pretty much the opposite of the usual writer dilemma, writer's block, in that I've got plenty to write about but just haven't been able to find the time to write lately. And when I do get free time, I feel overwhelmed by all the things that are trying to burst out of my head onto the page. Added to all that is the fact that my job is asking me to start doing work for them while I'm home but they won't pay me for it. So, of course, I won't do it and (of course) they're trying to bamboozle me into doing it. The economy is bad, the company is struggling, etc, etc. That's what they tell me. Well, let's try to go through some of this stuff in a clear and organized manner. Hopefully that will help me take this Building Roam thing past these hovering clouds and up to the heights I'm hoping to lift it to over these next few months. Let's start with San Francisco. When my girlfriend told me she wanted to go to the World Vegetarian Festival Weekend in San Francisco a few weeks ago, I immediately said yes and we began planning a little weekend road trip up to the Bay Area. It would be my first real (longer than 3 hours) road trip since my migration out to San Diego from New York in 2008. I was hyped. Somehow I hadn't realized that the Padres, the team I've followed closely and rooted for all season, would be playing their final three games of the regular season facing the Giants in San Francisco that same weekend. When the Padres went on a losing streak and relinquished their tightly held division lead to the Giants, and with baseball's other postseason spots decided already, that final series in San Francisco would become the focus of the entire baseball world. On Friday we began our journey a bit later than we should have, not getting on the road until about 3 PM. By the time we reached Los Angeles three hours later, we found ourselves in Friday afternoon rush hour gridlock that tortured us for hours. We still had many many miles to cover until our final destination but we were stuck in LA quicksand. My girlfriend and I began to bicker, we were drowning in an ocean of cars. Before the bickering exploded into something bigger that might jeopardize the precious road trip, we got off at the closest exit and went to a gas station. I went inside to pee and buy some snacks and stood behind a couple of guys waiting for the bathroom already. "Wish I could just take a number and then go buy some stuff," I joked to the gentleman waiting at the back of the line. He proceeded to engage me surprisingly quickly into a pretty one-sided conversation in which he told me how he and his partner (standing next to him nodding every few minutes) were professional drivers who transport 16-wheeler trucks all over the country, this was their first time in Southern California and they were already sick of it because of all the traffic. He carried on for a while and I listened with great interest (what can I say, it was interesting) as he told me all about the job and even mapped out the exact routes they were traveling which reminded me of Chris Farley's security guard character spilling the beans in Wayne's World. Once we were back on the road and refreshed, we persevered for another 7 hours or so, zooming through the darkness of California's farmlands for what seemed like forever. We made it to the hotel after 3 AM, tired and ragged but very proud of our accomplishment. The weekend was spectacular. Everything seemed to go perfectly. We spent most of Saturday at the Veg Festival which took place in the lush arboreal enchanted forest that is Golden Gate Park and then, once I gave up on trying to get tickets for the sold out season finale against the Padres, we spent Sunday touring the city, going across the Golden Gate Bridge, and checking out a great Dali exhibit at a cool art gallery in Fishermen's Warf. The exhibit featured rare and exclusive sets of Dali's work like The Alchemy of the Philosophers and his illustration of Dante's Divine Comedy. When the Giants defeated the Padres the city was vibrant. As much as I wanted the Padres to win, it was actually very cool being in the middle of a big city like that when their team clinched a playoff spot (for the first time in 7 years). Without knowing what happened, it would have been pretty easy for one to ascertain as plenty of Giants fans zoomed through the streets honking their horns and waving orange flags and lively, skipping orange-clad fans swarmed the sidewalks. It wasn't until today that I realized the cool subjective coincidence or synchronicity. Before this past weekend I had only been to San Francisco once, in the summer of 2008 when I visited a potential graduate school (CIIS if you must know). That time, I stayed for just three days and was alone, not really prepared to tour the city and absorb its splendor. But I did go to a Giants game. They faced the Atlanta Braves in a pretty meaningless and crappy (and freezing) game as both teams were well out of the playoff race and on their way to a 4th place finish. Now, after the Giants fought off my very own Padres in the season's final game while I was back in San Francisco again, they are facing (who else?) those same Atlanta Braves in the postseason. Tonight I watched and marveled over Tim Lincecum's absolutely superb start against Atlanta in which he struck out 14, walked one, and allowed only 2 hits. I've said before that he is perhaps the most entertaining player in baseball right now and he was truly a spectacle tonight. 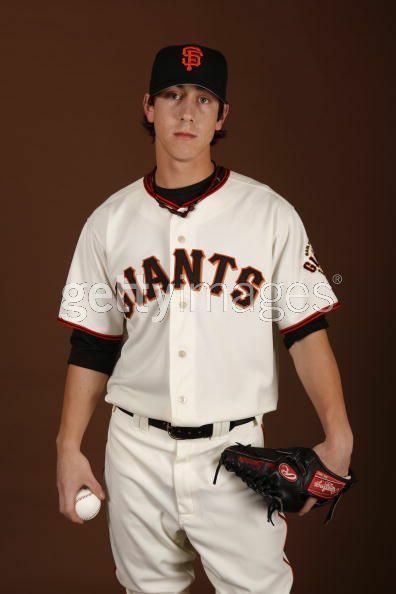 The 26-year-old Lincecum is very generously listed at 5'11" and 170 lbs but he looks more like 5'9" and maybe 150. That's about how big I am. I'm simply awestruck watching this kid baffle major league hitters the way he does. Watching the Braves flail over and over again, an old thought popped into my head, a thought that used to occur to me while watching baseball as a naive young child: "are they even trying to get a hit?" With his funky, herky jerky wind up, shoulder-length hair, and all-around skateboarder punk aura (he was busted for pot possession in the offseason) he presents an image unlike anything I've ever seen in baseball. He's like a little punk kid who goes out on the mound and makes all the older bigger guys look like idiots. 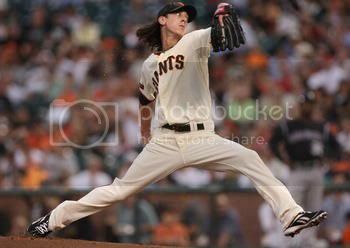 And unlike the squeaky celebrations of the phenom kid in Rookie of the Year or the ugly roaring gyrations of Joba Chamberlain, Lincecum carries himself with the utmost calmness and professionalism. When he struck out the final batter tonight for his 14th strikeout (shattering the Giants franchise mark for strikeouts in a playoff game in his first career playoff game) to complete a two-hit shut out, he simply made a fist, a sign of a job well done. Not the Tiger Woods kind of over-exuberant fist pump either, this was the gesture a geeky but confident kid would make after accomplishing a new high score in a video game at an empty arcade. "Yes, I did it."